Make your pizza from scratch, with homemade pizza dough. This simple combination is a classic that you will come back to again and again! 1 In a small bowl, mix together the yeast, sugar and warm water. Leave for 5-10 minutes to allow the yeast to activate. 2 In a large bowl, combine the flour and salt. Then add the rest of the water and olive oil. Mix together. Then add the yeast mixture from the other bowl. 3 Mix to combine, then knead until dough is smooth and elastic. Place in an oiled bowl, cover with a tea towel, and allow to rise until the dough doubles in size. 4 Divide dough into halves, and roll into discs. Place dough on an oiled tray and allow to rise a second time. 5 Roll dough flat, and spread passata over the pizza bases. 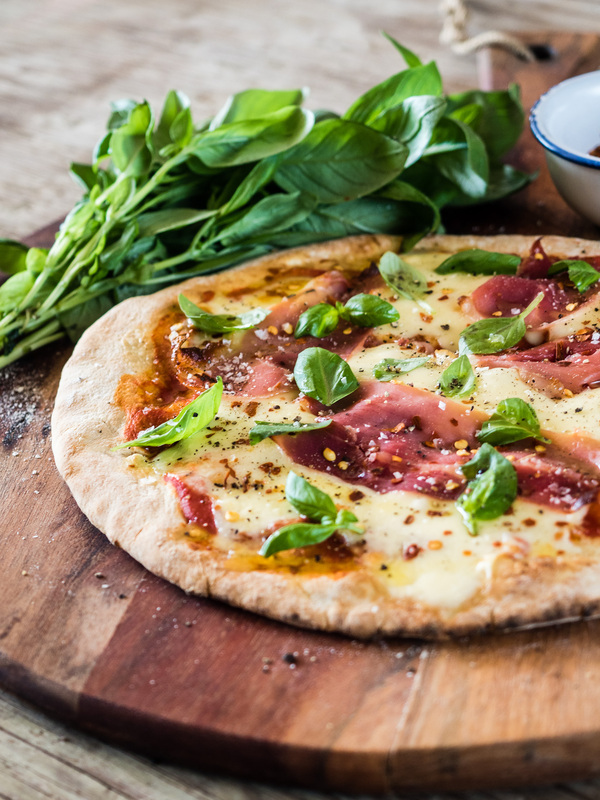 Arrange the prosciutto slices and the mozzarella over the tops of the pizzas. Bake for 7=10 minutes, depending on your oven type. 6 Scatter the chilli flakes and basil leaves over the top and serve warm.